Author and designer Alex Fowkes said that this book was created out of a love for playful typography. Indeed. Many of the examples showcased present playful ways in which you can reimagine typography, and use them in exciting and fun manners. The book covers four different styles of typographic work, namely hand rendered, vintage, playful and contemporary. The work featured clearly are curated for their beauty. The first section on hand rendered typography looks at the creative lettering and type designers. A total of 72 are featured. They talk about their inspiration and process, and also specifically at selected pieces of their work. The examples are beautiful, and it's not just typography but there are also other design elements at work to make the whole illustration work. There's a good variety of refreshing styles to check out. As such, it serves as a good reference, a book you'll want to browse through when facing a creative block. The first section has 170 pages, and the book has 208 pages. The second section is a workshop on type basics. It talks about the construction of a type. Using existing typefaces, you're invited to create your own range of type-based work. There are perforated pages with specimen sheets containing all the alphabets in different styles. These sheets are used for reference so you can trace over them and modify from there. The sheets have four sans serif, four serif, four script and four display type. 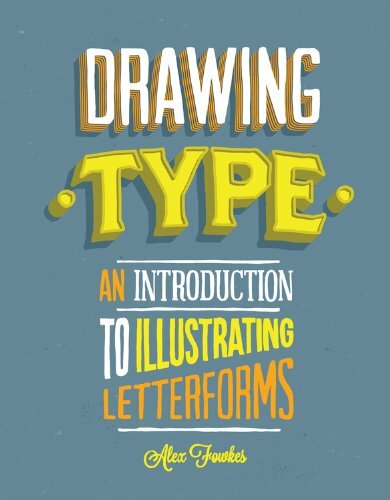 Drawing Type is a good resource for graphic and type designers. It's not so much a technical book on creating type, although you're introduced and invited to experiment with the selected reference typefaces that are picked out.